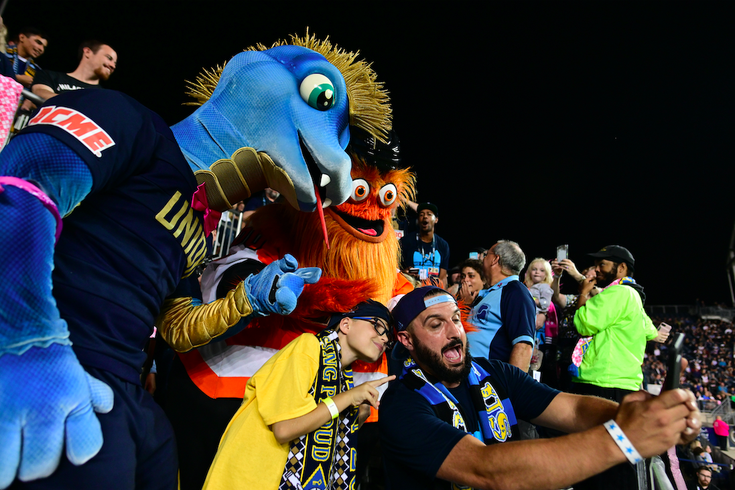 The Philadelphia Union's mascot Phang took in an October 2018 match with his peer from the Flyers, Gritty. Both mascots are new to the Philly world, but the orange creature gobbled up substantially more attention in the weeks since. ‘Twas the 10th day of September when the Philadelphia Union commandeered a treehouse at the city’s zoo to bestow upon the world its new mascot, Phang. The “hatching” ceremony was a hit with the children who’d assembled that Monday afternoon and a source of condescending snark from those who chose to question why on earth a snake mascot would have arms and legs. Normally, new mascots in town have some time in the spotlight. They’re shiny novelties; it takes a little time before the glitter starts to fade. Little did most people know that day that in two short weeks, along would come yet-another new mascot that would take the city, region, late-night talk shows and world by storm. Gritty, the orange googly-eyed monster repping the Philadelphia Flyers, quickly went from nightmare fuel to a member of everyone’s extended family – whether for good or for ill.
As Gritty is wont to do, the seven-foot creature barreled forward with the force of a boulder, consuming every bit of available attention in its path. That dynamic got us to thinking about the impact on the city’s other mascots, all of whom showed up at Phang’s debut. We reached out to Phang, requesting an interview to delve into what it’s like to have your 15 minutes cut drastically short by no fault of one's own. Substantially more well-spoken than we’d anticipated, he graciously agreed to answer our queries. 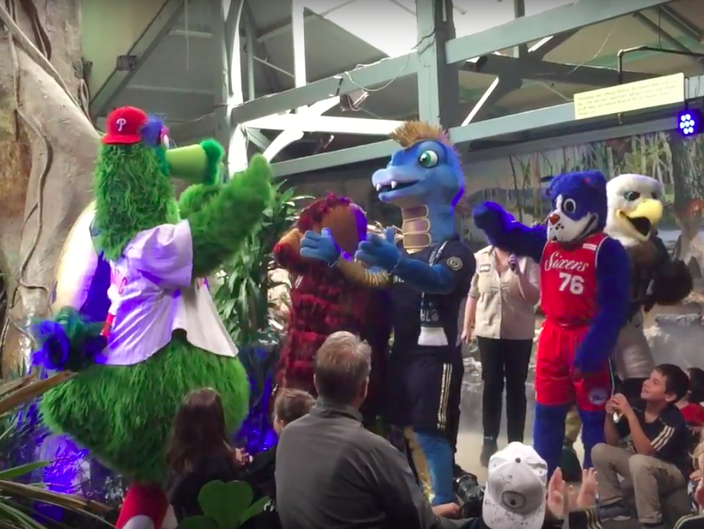 Mascots from several pro teams (and one from college) went to the Philadelphia Zoo on September 10, 2018 to welcome the Philadelphia Union's Phang the Blue Racer Snake to their exclusive club. What’s life been like for you since you were hatched at the Philadelphia Zoo? Can’t complain, really. I mean, yes obviously, the season ended sooner than we would have liked but that’s what makes our field so cruel and wonderful. At the end of the year, only one team wins their final game. I still got to spend a lot of time with young Union fans, and I’ve played some raucously fun soccer as well. As far as being a new mascot goes, I was only really the new guy for a couple weeks before our friend Gritty became the new-new guy and then, as you know, Wingston came along as the new-new-new guy. Of course, at first I felt a sense of that all-too-familiar imposter syndrome. How could I, a lowly snake-turned-snake-with-arms-legs-and-a-mohawk stand side by side with the epitome of sports mascots: the Phillie Phanatic!? Quickly though, Swoop, Franklin, and the aforementioned Phanatic took me under their wing, paw and arm, respectively. This truly is the City of Brotherly Love. On top of all that, I can’t go on without mentioning my fans that bring it in the purest form. Of course, I’m talking about the one and only Wu Phang Clan! It’s amazing to know that no matter what they have my back for life! Some folks questioned why you have arms and legs – in a rather dismissive sense. What would you like to say to those crazy haters? Well, as my girl T-Swift says, “Haters gonna hate, hate, hate, hate, hate.” It’s fine. They’re all entitled to their opinions — it just rolls off my scaly back. Honestly, I just hope the city realizes I’m just another undersnake story: a young reptile who loved a sport he literally could not play. I took inspiration from those that came before me and found a way to get it done. Yo, Adrian! I did it! Two weeks later, another mascot made its way to the Philly sports world. You know him well as evidenced from meeting him at a match at Talen Energy Stadium. What was your initial impression of Gritty? I believe my initial impression of Gritty matched that of everyone else: AAHHHHHHHHHHHHHH WHAT HATH GOD WROUGHT!?! Then, I realized I look like that, too, when I first wake up (and the lighting wasn’t doing him any favors). I was very excited to meet him in person and discuss philosophy, esoterica, and the fact that it’s hard for both of us to make eye contact with both eyes at once. Dude has some hot takes let me tell you, too hot for my cold-blooded nature. Gritty has gotten much attention and I almost feel as if you’ve been overshadowed in a sense. Does that bother you at all? I have to admit that I was worried about torpor – look it up, kids; it’s a real problem and you’ll be hearing more on it from me when Torpor Awareness Month comes around – setting in as the shadow of the Gritastic One grew large and the air grew cold, but ultimately there’s room for all of us crazy creatures in this fair city. If anyone has forgotten about a 7-foot snake with arms and legs and a mohawk, then I’m a bit concerned for their health. Perhaps take up sudoku? Personally, I’ve had great fun with acrostic puzzles. They say that things like that keep the brain sharp. Perhaps then their mental faculties will stay a bit stronger. The Union’s season ended in a disappointing playoff loss, but you were part of one of – if not the – best seasons in club history. What should fans expect to see when the 2019 season gets underway? By many metrics, this was indeed the greatest Union season and by all metrics it was the greatest Union season I’ve ever been a part of. Everybody knows about the points, the wins, and the road wins. I mean, even my snake friends text me about all those assists Borek Dockal had! Of course, I wish I had been able to celebrate a playoff win in my first year with the team, but if I can’t have that I still want to hiss for a team that scares the opponent, and my squad did that. I always tell kids that you have to believe in yourself and what you stand or slither for, and my team did that this year. Next season? We’re turning Talen into the Snakehole Lounge, my dude. (Union Sporting Director) Ernst Tanner is all about what you do without the ball: get close to each other, lock the opponent into a zone, and when you win the ball back you’re headed upfield before the other team can say anaconda (by the way, I’m friends with many anacondas, and that movie with J-Lo and Cube was a hit piece and don’t get me started on Sir Mix-A-Lot...is he even a real knight?!). Philadelphia very well may host a World Cup match in eight short years. Do you plan on having your friend Gritty involved in welcoming the world to the city should we host a match? That sounds like it could be a recipe for mascot-infused disaster. Hmmm, it seems like you might have a bit of an axe to grind with our friend Gritty. You might want to speak to someone about that. Open dialogues with friends, co-workers, neighbors, or even mental health professionals can do wonders for grudges. I, myself, have been the sounding board for young Mark McKenzie when he feels particularly salty over a hard loss in FIFA to almost-as-young Auston Trusty. But I digress. The World Cup is an amazing feat of sport and I, for one, am over the moon at the prospect of Philadelphia becoming a host city for many reasons. Not the least of which that perhaps Philly could finally shirk the hackneyed and stale narrative of being a brutish collection of rabid savages who hurl projectiles at beloved figures. In my albeit short time here, I’ve never once been assaulted with anything other than an unusually strong high-five. Wait, there was one time when a Sons of Ben member pelted me with a small piece of a soft pretzel. I was pretty hungry at the moment and I could tell from his eyes that he had his own stuff going on, so I just scarfed down that jawn and tried not to judge. I guess you could say I truly was a-salted that day.